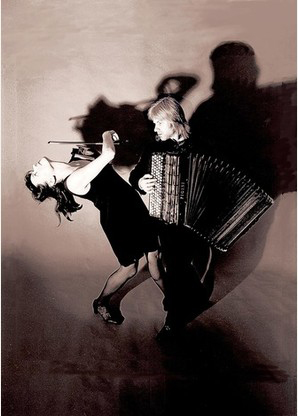 An intoxicating blend of Russian Folk and Gypsy songs, Hot Club Jazz, Tango, Gypsy fiddle and Balkan beats. MAZAIKA duo consists of two highly talented, passionate and versatile musicians. Sarah Harrison is a violin virtuoso and improviser. Igor Outkine is a singer and a master accordion player who will perform on his amazing midi accordion which he proudly calls “The Chameleon Virtual Orchestra”. Igor appears on screen in the feature film “Eastern Promises” (2007) directed by David Cronenberg singing Russian song Dark Eyes. Artists they have worked with include Marc Almond, Facinating Aida, Antonio Forcione, Django Bates and Loyko.